The Old Dominion Athletic Conference has announced its All-Academic Team for the 2011-12 season, and Eastern Mennonite University saw an increase to 61 student-athletes earning a spot. Last year 53 Royals were named to the team. Each of EMU’s sports was represented on the ODAC All-Academic Team except for men’s volleyball, which competes in the Continental Volleyball Conference. The CVC will also release an all-academic team later this summer. The full ODAC All-Academic Team eclipsed 1,000 student-athletes for the sixth consecutive year and set a new high-water mark for conference honorees for the third year in a row. With representatives from each of the 17 ODAC institutions (including Catholic University for football only, Greensboro College and Notre Dame of Maryland University for swimming only, and Shenandoah University for field hockey and track & field only), 1,350 student-athletes earned recognition on the 2011-12 ODAC All-Academic Team. For more information, visit the ODAC’s home on the Internet at www.odaconline.com. Don’t forget to become a fan of the ODAC on Facebook (click HERE) and follow @odacathletics on Twitter. The entire list of Royals named to the ODAC All-Academic Team is listed below. 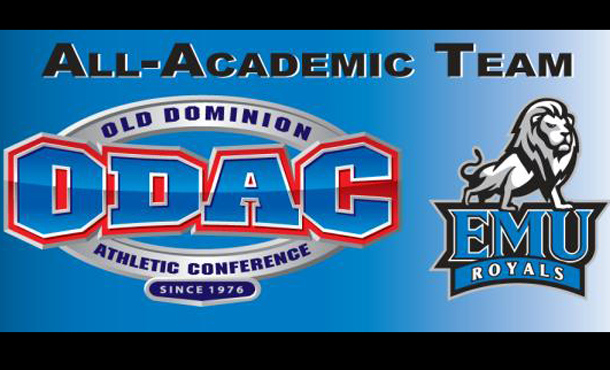 Click here to see the full list of the ODAC All-Academic Team.